Traditional cheesecake is the perfect dessert. But add on some toppings or mix-in’s and it becomes so much more! These 20 unique cheesecake recipes are some of the best and most popular homemade desserts. Who doesn’t love a good holiday dessert? I admit wholeheartedly that I do! But the desserts of my childhood, the pumpkin, and pecan pies are no longer as alluring as they once were. Well, at least in their traditional, store-bought form. And now as an adult, my ideas of what’s delicious have changed. Traditions are good, but it’s also important to make your own family traditions. And there are so many creative options now that I love that there are new possibilities for holiday desserts. One of my favorites any time of year, even in its classic form is cheesecake. So I set out to find some of the most unique holiday cheesecake recipes to see how a classic could be reborn with a little festive flair! These are unique types of cheesecake that are perfect for any holiday. What are the ingredients for cheesecake? The ingredients for homemade cheesecake will vary based on the flavor but most cheesecake recipes usually have a base of cream cheese, eggs, sugar, and vanilla. The holiday cheesecakes below have some really unique cheesecake flavor combinations. You’ll see different drinks added to the cheesecake for flavor like Dr. Pepper and bourbon. You’ll also see everything from mini cheesecakes and bundt cakes to brownies and salads. There truly is a unique cheesecake for every holiday. What is the most popular cheesecake flavor? Based on Googling, the most popular cheesecake flavor is strawberry. Are you surprised? Did you think it might be cherry? I have to admit that I did. Whether you’re a pro at making unique desserts or need a no bake cheesecake, there’s an easy cheesecake dessert recipe for you! Have you tried any unusual holiday cheesecakes? What’s the most untraditional flavor you’ve tried? For me, it would have to be root beer! 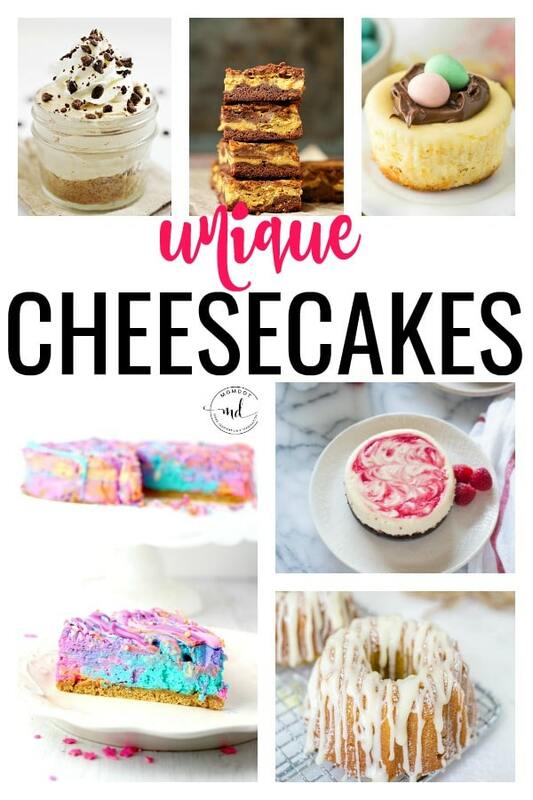 Make sure you pin these unique cheesecake dessert recipes for later! I love cheesecake! They all look so good. I love cheesecake! Give me any flavor and I am in heaven. That eggnog cheesecake with rum sounds like a dream. Thanks for sharing this great selection! The maple praline looks really good!! It’s so nice to be able to serve up unique cheesecakes!! I love nothing more than a great cheesecake. The salted caramel one looks amazing.